"Who is this coming from Edom, from Bozrah, with his garments stained crimson? Who is this, robed in splendor, striding forward in the greatness of his strength? 'I have trodden the winepress alone; from the nations no one was with me. I trampled them in my anger and trod them down in my wrath; their blood spattered my garments, and I stained all my clothing. It was for me the day of vengeance; the year for me to redeem had come. I looked, but there was no one to help, I was appalled that no one gave support; so my own arm achieved salvation for me, and my own wrath sustained me. I trampled the nations in my anger; in my wrath I made them drunk and poured their blood on the ground.' "
63:1 The watchman asks who is coming. Someone is approaching Israel from Bozrah in Edom. Bozrah was the capital of Edom. Edom was Israel’s southern enemy. “Righteousness” - His speech is done from the character of righteousness. He is active and speaking. He is not an inactive, mute idol. What he says is right, true or based in reality. This is not the case of his enemies. He has the power to save and deliver. When he appears he brings salvation to his people. The antithesis of salvation for his people is destruction of the enemies. 63:2 The watchman can see the returning warriors garments are stained red. God has emotions. His love for his people is balanced by his anger for his (and their) enemies. We can see in Isaiah 53 (the defeat of our inner enemy sin) and 63 (the defeat of the outer enemies the nations) that without a Messiah we would never be able to overcome. Who could help? No one. Notice the anger of God and the vengeance of God are not to get even but to work his plan of salvation. “the year of my redemption has come” shows many years and seasons have gone before but not it is time for redemption. Redemption and Vengeance are opposites in this case. Redemption for his people, Vengeance for his enemies. 63:6 The winepress image of “made them drunk” and “poured their blood on the ground” is a picture of the enemies being so deep in blood that they drown. Isaiah 53:12 describes the Servant shedding his own blood (“pouring out his soul”) to save these enemies from themselves and their world by making them righteous. They refuse to be changed by the gift and so now die in their own blood. Israel now reflects on what Isaiah has just promised (63:7-14) Israel’s obvious question is “If 63:1-6 are true, why are we still in this mess? Stulos (Gr) – pillar (Eng) – the Greek word stulos refers to the column that supports the weight of a building. Stulos is used to refer to the leaders of the church in Galatians 2:9. I will rejoice today because I have a deliverer who has saved me and will continue to deliver me now and in eternity. 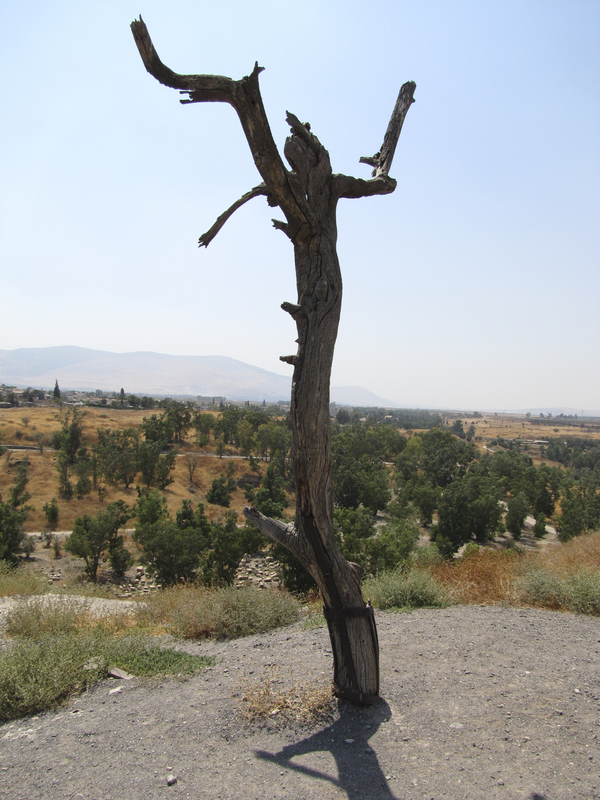 On the tel of the Old Testament remains of Beth Shean. This tree was the actual tree used to film the suicide of Judas in the 1970's movie "Jesus Christ Superstar." 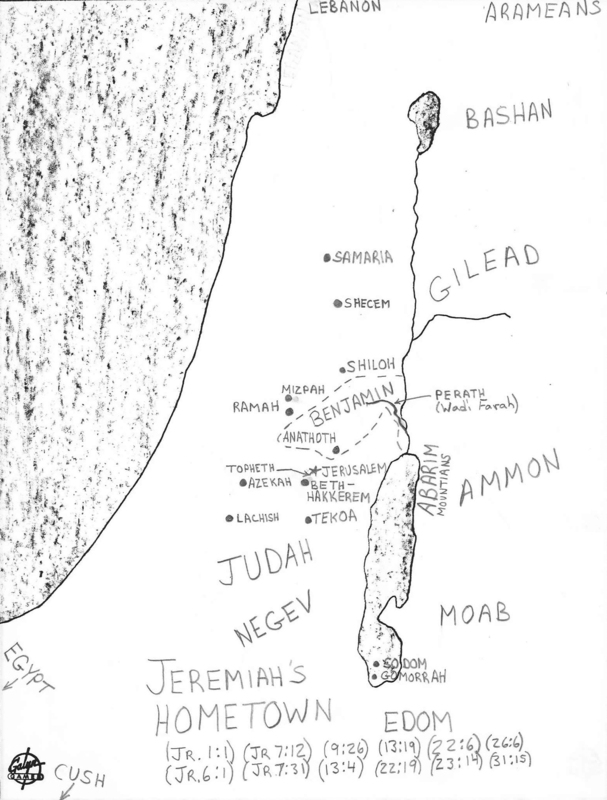 Locations important to the book of Jeremiah detailed on a map. Nations Only four generations after the flood, people were divided into different cultures with various languages in separate lands; each of these nations had developed its own government. Genesis 10 lists the original seventy nations that came about as a result of God developing this new institution. Nationalism remains a safeguard for the world today. It stops us from having a corrupt one-world government. Now, when one nation goes astray, God can deal with that nation directly through a cycle of discipline over a period of generations. If that nation remains unwilling to repent, God can eliminate them from human history without wiping out everything as he was forced to do in the worldwide flood. A list with images and details of over 30 seal impressions (bulla) from Bible times. A list from Wikipedia of biblical people identified in sources outside the Bible. "The path of the righteous is like the first gleam of dawn, shining ever brighter till the full light of day." all because of the wanton lust of a prostitute, alluring, the mistress of sorceries, who enslaved nations by her prostitution and peoples by her witchcraft. “I am against you,” declares the Lord Almighty. “I will lift your skirts over your face. I will show the nations your nakedness and the kingdoms your shame. Yet she was taken captive and went into exile. Her infants were dashed to pieces at every street corner. Lots were cast for her nobles, and all her great men were put in chains. Look at your troops— they are all weaklings. The gates of your land are wide open to your enemies; fire has consumed the bars of your gates. There the fire will consume you; the sword will cut you down— they will devour you like a swarm of locusts. Multiply like grasshoppers, multiply like locusts! You have increased the number of your merchants till they are more numerous than the stars in the sky, but like locusts they strip the land and then fly away. Your guards are like locusts, your officials like swarms of locusts that settle in the walls on a cold day— but when the sun appears they fly away, and no one knows where. King of Assyria, your shepherds slumber; your nobles lie down to rest. Your people are scattered on the mountains with no one to gather them. Nothing can heal you; your wound is fatal. All who hear the news about you clap their hands at your fall, for who has not felt your endless cruelty?